Dr. Keller was a dentist in Skagway from 1899 to about 1922. He also published the Daily Alaskan from about 1905 to 1915 according to the directories. He was born in St. Paul Minnesota in 1860. The 1880 census in St. Paul Minnesota shows Mrs Aunice Keller with eight children that ran a lumber business. Her husband must have died in 1879 because the youngest child was still a baby. Louis married Martha in 1891 and moved to Skagway in the Gold Rush. He was President of the Fraternal Order of Elks in 1900 and was a member of the Arctic Brotherhood in 1907. He was also president of the Chamber of Commerce in 1903. He was elected Mayor of Skagway in 1922 but became ill with throat cancer and died on this day, November 30, 1922 in Seattle. He and Martha had no children. Louis’ brother, John Michael also moved to Skagway and started a drug store, “Keller’s” which is still run, but as a jewelery store today. John also helped to run the newspaper with Louis and Martha. Seen above, in hard times before restoration efforts in the 1980’s is the store. 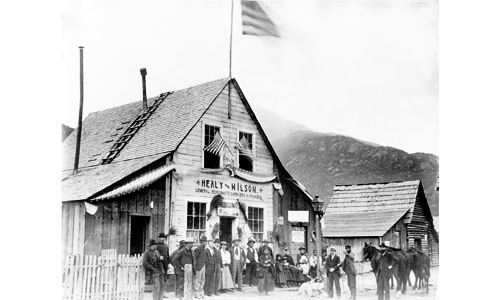 George Dickinson ran the Northwest Trading Post with his wife, Sarah, a Tongass Tlingit as early as 1880. In 1886 he partnered with J.J. Healy at the trading post in Dyea. He became ill and died in San Francisco on this day, November 29, 1888. His obituary in the Juneau City Mining Record of November 29,1888 gave his age at death as 45. Sometime later, the Healy and Wilson trading post is seen above in this Anton Vogee picture. 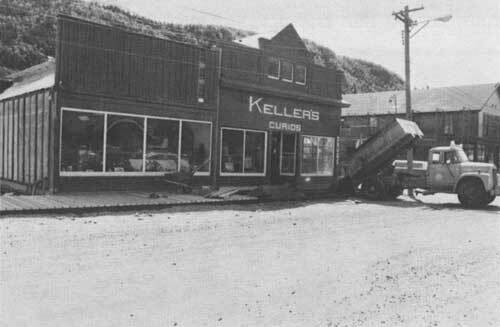 Neufeld:Juneau City Mining Record Nov 29 article; Daniel Lee Henry book online excerpt; San Francisco Call. Seghers was born on December 26 1839 in Ghent, Belgium. Left an orphan at a very early date, he was brought up by his uncles. 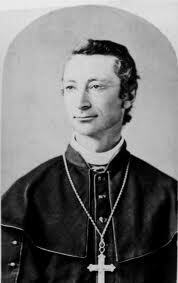 After having studied in local institutions and in the American Seminary at Louvain, he was ordained priest on 31 May, 1863. He then left for Vancouver Island, where he was engaged missionary work among the pioneer whites and the natives. After several years of hard work establishing missions in the Northwest, the Pope appointed him Archbishop of areas in the Northwest including Alaska. When Bishop Seghers arrived at Dyea in 1886 he was slapped in the face by the Klanot chief of the Chilkoot tribe. Undeterred, he decided to climb the Chilkoot Pass with four other men, Father Pascal Tosi, Father Aloysius Louis Robaut, the cook Antoine Provost, and a man named Frank Fuller. On November 27, Seghers and Fuller, with two native guides they had acquired at Nuklukayet, decided to spend the night at the fish camp at what is today known as “Bishop’s Rock”. Seghers was in high spirits, laughing frequently, thinking that he would finally reach Nulato the following day. Fuller, however, remained sullen, looking suspiciously at his companions and remaining agitated throughout the night. Between six and seven the next morning, the party arose and prepared for the final leg of their journey. As Seghers bent over to pick up his mittens, Fuller fired a single shot which killed Seghers instantly. Seghers died on this day November 28, 1886 at the age of 47. Fuller was then arrested, taken to Sitka for trial and sent to prison for eight and a half years. When let out, in Portland, Oregon, he got into a violent quarrel with a neighbor and was himself murdered. Harry, or Henry Schofield was born in 1857 in Germany and came to America in 1892. He came to Skagway from San Francisco and worked variously as a longshoreman, a seaman, and a fisherman. He got into trouble in 1900 when he sold liquor to the local Natives, and was found guilty by Judge Sehlbrede. He apparently had a liking for alcohol and on this day, November 26, 1903 died at the age of 46 here in Skagway from heart failure due to alcoholism. 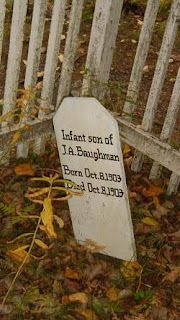 He is buried in the Gold Rush Cemetery. In 2008 almost 12% of the deaths among American Indians and Alaska Natives are alcohol-related, more than three times the percentage in the general population, a federal report said. In our small community we know of one young local Alaska Native person who died from a drug and alcohol overdose a few years ago. She is buried in the Skagway “New” Cemetery on Dyea road. 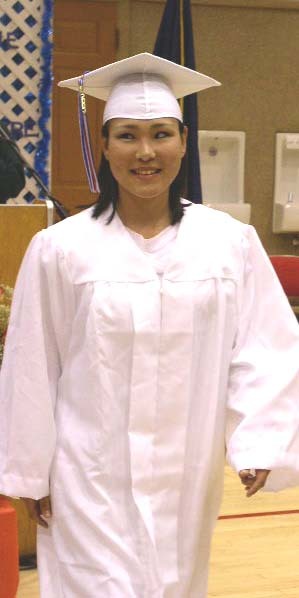 She is seen above at her graduation from Skagway high school in 2003. 1900 census; Thornton; Skagway death record;Newspirates.com 30 August 2008 by Jim Walrod. Dr. John Baughman was a Physican and assayer. He was born in Barberton, Ohio on March 10, 1856. I read somewhere that his family was Jewish which would add to my growing list of Jewish families in Skagway in the gold rush, but I cannot find that source again, so just a possibility there. After graduating from college as a doctor, John Baughman married Mina Barber in Manistique, Michigan on February 25, 1897. 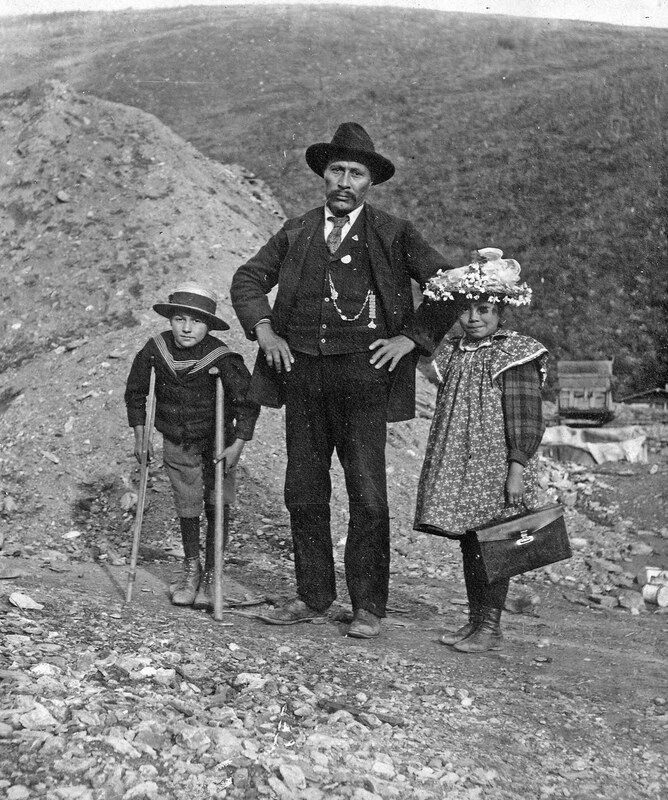 Struck with gold fever Dr. Baughman joined the stampede to Dawson in 1897. Expecting to practice medicine there, he found the profession barred from him because he was not a Canadian citizen, so he joined in the search for gold. Later her returned to Michigan where he brought his wife to Skagway in 1899. Dr. Baughman practiced medicine in Skagway until 1905. Their first son, Paul was born here in 1899 but died in 1904. Their second son born in 1903 also died in 1903 and both are buried in the Gold Rush Cemetery. Their daughter Dorothy, born around 1905 lived a long life and is buried in Juneau. After leaving Skagway in 1905, the family moved to Seward where Dr. Baughman was a doctor for many years and established the Pioneer Hospital, ministering to a large section of Alaska. While in Seward, he was Game Warden of the Third Division for eight years. He also operated a drug store. The Daily Alaska Empire obituary said he was Alaska’s oldest physician when he died on Thanksgiving Day, November 25, 1937 in Juneau. He was a life member of the Masonic Order, affiliated with the organization for 45 years. He is buried in the Juneau Evergreen Cemetery. 1902 directory; Juneau Evergreen records; family search; The Daily Alaska Empire–Friday, 26 November 1937-Page 1 & Page 8. 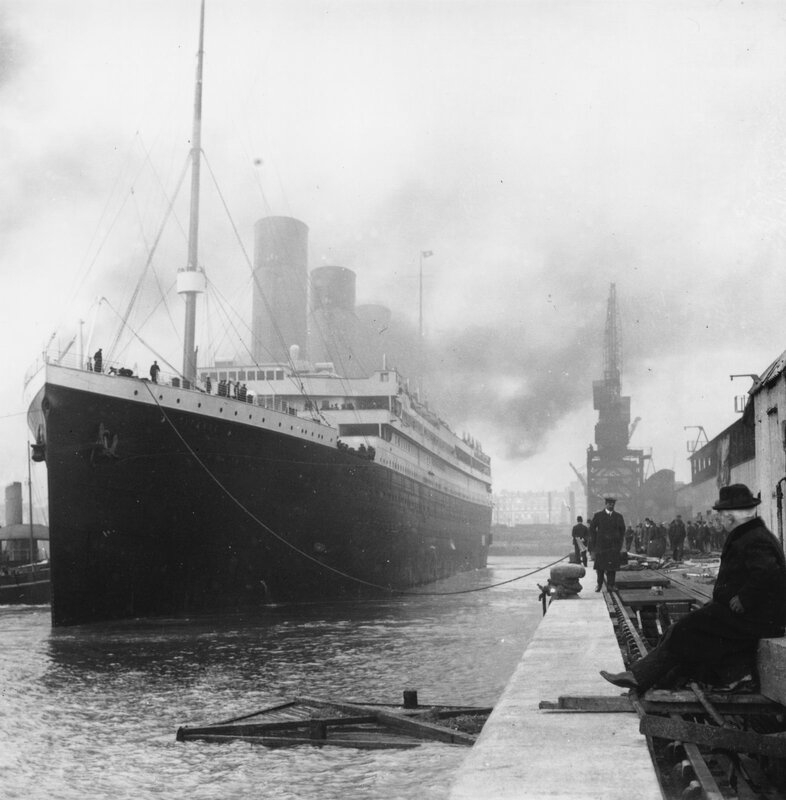 What does the Arctic Brotherhood have in common with the Titanic? The answer is George Goldschmidt. Born in New York on October 16, 1840 he came to Skagway in February 1899 on the ship City of Seattle with 10 other men, who, on their way to Alaska decided to form their own secret society for good fellowship and brotherly love: The Arctic Brotherhood. However, he does not show up later on any of the later membership rolls, he was a man on the move! He boarded the Titanic at Cherbourg as a first class passenger (ticket number PC 17754, £34 13s 1d). He occupied cabin A-5. Goldschmidt died in the sinking. His body, if recovered, was never identified. Charles Davis was born in 1840 in Ohio and claimed to have fought in the Civil War. 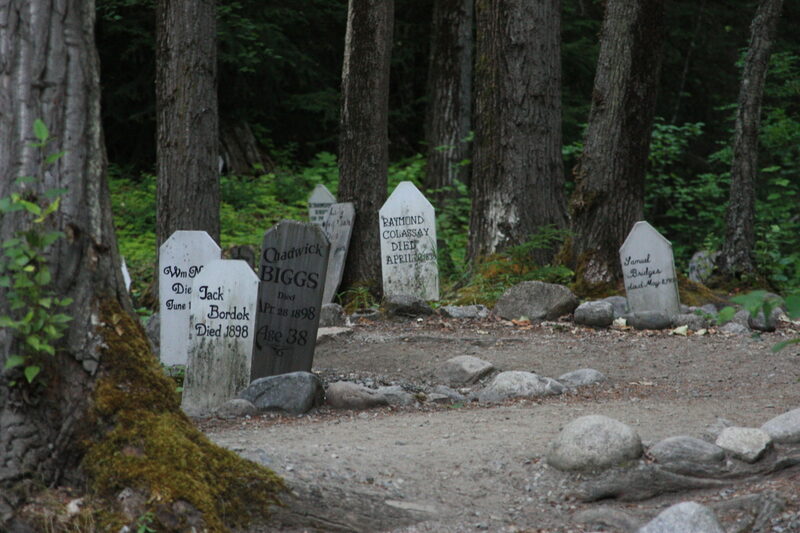 He was a prospector and a laborer in Skagway from before 1910 to his death, on this day, November 22, 1938. His peculiar cause of death was detailed in Robert Dahl’s book. 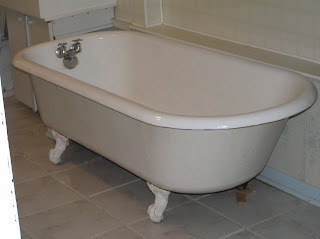 He said his father, Dr. Dahl, told the nurses to bathe him because he smelled bad since he never bathed. Davis thought that bathing would cause death. In his case it did. He is buried in the Pioneer Cemetery. Daisy was about 7 years old in this photo taken in about 1902. She was born in 1895 probably near here. She was the daughter of Skookum Jim Mason who in 1896 found gold at Rabbit Creek, showed it to George Carmack and they staked the Discovery Claim…. Daisy was known as Saayna aat and Skookum Jim was known as Keish. Daisy’s mother was named Mary. Daisy died in Carcross in 1938 at the age of 43 and is buried there next to her famous father. I do not know who the boy is, perhaps someone out there knows? Anna was born in 1861 in Cornwall, England. After coming to America, she was working as a maid in Sonora when she met a young handsome Jewish man named James Fink. James dropped his real name and adopted his stage name of George Thornton Snow. Anna and George were married and became talented performers who traveled the gold camps of California. They had two children in Sonora. In 1887 the family took passage on the old side wheel steamer “Olympia” to Juneau for a six week stint to provide classical entertainment to the miners there. They liked Juneau and stayed. George was soon hit with “gold fever” and made two trips to the Yukon leaving Anna in Juneau to eke out a living by sewing. After returning to Juneau in 1894, he planned to go north again but Anna put her foot down and said “If you go we’re going”. They took the little tugboat “Rustler” up the Lynn Canal to Dyea. 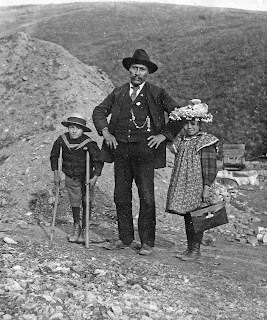 The Snow family crossed the Chilkoot in 1894. Daughter Crystal Brilliant, age 10 and son Montgomery, age 11 were perhaps some of the first children to cross. One of the items that they dragged over the pass was a three octave organ. At the top of the pass they were hit by a blizzard and had to build a tent to hunker down for three days. Crystal and Montgomery played “igloo”. George was so proud of his early accomplishment that he started the Yukon Order of Pioneers that year. The family opened the Grand Opera House at Circle City where they all performed. (See the store in Circle City above in 1897.) They moved back to Skagway in 1909 and George became the City of Skagway jailer. George died in Seattle in 1925 at the age of 78 (he was quite a bit older than Anna). Anna Snow died on this day, November 19, 1943 in Juneau at the age off 82, and is buried in the Juneau Evergreen Cemetery. 1910; Klondike Centennial Scrapbook p. 145;Snow Family papers in Alaska Historical Collections at the Alaska State Library; Gates; More than Petticoats, Remarkable Alaska Women by Cherry Lyon Jones; Familysearch records; Juneau Parks and Rec site. In the 1950’s through the 1980’s quite alot of lead ore was mined in the Yukon and moved by train to Skagway. It was then unloaded onto barges. 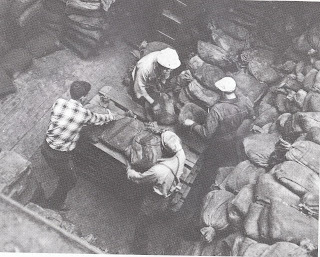 In those years, the effect of lead contamination was not known, hence you see the Skagway longshoremen above moving cloth bags of lead and zinc ore by hand onto pallets in the hold of a ship. No gloves, respirators, or other safety equipment.